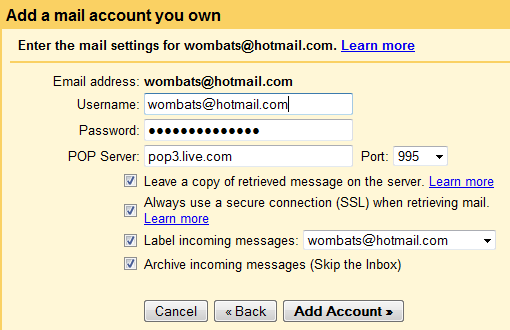 Now that Hotmail started to support POP3, you can import messages from Hotmail accounts into Gmail using the mail fetcher. Enable all the four subsequent options (the only option that’s required is “Always use a secure connection (SSL) when retrieving mail”). Since the mail fetcher emulates a standard mail client that supports POP, it will check for new messages periodically. You also have the option to add the Hotmail address as a custom “From” address so you no longer have to compose messages in Hotmail.